Nice set of Bloomingville Ava dishes with a diameter of Ø11.5 cm and a height of 6.5 cm. The beautiful Ava series is handmade from earthenware and is unique in pattern. This set consists of 12 pieces and is not dishwasher safe. Nice set of Bloomingville Ava serving dishes with a diameter of Ø27.5 cm and a height of 7.5 cm. The beautiful Ava series is handmade from earthenware and is unique in pattern. This set consists of 6 pieces and is not dishwasher safe. Nice set Bloomingville Ava serving dishes with a diameter of Ø21.5 cm and a height of 6.5 cm. The beautiful Ava series is handmade from earthenware and is unique in pattern. This set consists of 6 pieces and is not dishwasher safe. Nice set Bloomingville Ella plates with a diameter of Ø27 cm. The beautiful Ella series is handmade from earthenware and is unique in pattern. This set consists of 12 pieces and is dishwasher safe. Nice set Bloomingville Ella plates with a diameter of Ø21 cm. The beautiful Ella series is handmade from earthenware and is unique in pattern. This set consists of 12 pieces and is dishwasher safe. Nice set of Bloomingville Ella bowls with a diameter of 14.5 cm and a height of about 7.5 cm. The beautiful Ella series is handmade from earthenware and is unique in pattern. This set consists of 12 pieces and is dishwasher safe. Nice set of Bloomingville Ella serving dishes with a diameter of Ø33cm and a height of about 6 cm. The beautiful Ella series is handmade from earthenware and is unique in pattern. This set consists of 6 pieces and is dishwasher safe. Nice set Bloomingville Ella mugs with a diameter of Ø9cm and a height of 9 cm. The beautiful Ella series is handmade from earthenware and is unique in pattern. This set consists of 12 pieces and is dishwasher safe. Nice set Bloomingville Stella mugs with a diameter of Ø9cm and a height of 5.5 cm. The beautiful Stella series is handmade from earthenware and is unique in pattern. This set consists of 12 pieces and is dishwasher safe. Nice set Bloomingville Stella mugs with a diameter of Ø7,5cm and a height of 9,5 cm. The beautiful Stella series is handmade from earthenware and is unique in pattern. This set consists of 12 pieces and is dishwasher safe. Nice set Bloomingville Stella mugs with a diameter of Ø7cm and a height of 7 cm. The beautiful Stella series is handmade from earthenware and is unique in pattern. This set consists of 12 pieces and is dishwasher safe. Nice set of Bloomingville Simone dishes with a diameter of Ø13 cm. The beautiful Simone series is handmade from earthenware and is unique in pattern. Set consists of 8 pieces. Nice set Bloomingville plates with a diameter of Ø21 cm. The beautiful plate set is made of bamboo and has black dots. Set of 12 pieces. Nice set of Bloomingville signs with a diameter of Ø28 cm. The beautiful plate set is made of bamboo and has black text. Set of 12 pieces. Nice set Bloomingville mugs with a diameter of Ø9 cm and height of 13 cm. The beautiful mugs set is made of bamboo and has black text. Set of 12 pieces. Nice set of Bloomingville bowls with a diameter of Ø14.5 cm and a height of 7 cm. The beautiful bowl series is made of bamboo and has black dots. Set of 12 pieces. Nice set Bloomingville Anna scales with a diameter of Ø9 cm and height of 6 cm. The beautiful Anna series is handmade from earthenware and is unique in pattern. How do you combine this set? Nice set Bloomingville Anna mugs with saucer. The beautiful Anna series is handmade from earthenware and is unique in pattern. How do you combine this set? Nice Bloomingville Anna sign with raised edge and a diameter of 21.5 cm. The Anna series is handmade from earthenware and is unique in pattern. How do you combine this set of 12 plates? Nice Bloomingville Anna sign with raised edge and a diameter of 26 cm. The Anna series is handmade from earthenware and is unique in pattern. How do you combine this set of 12 plates? 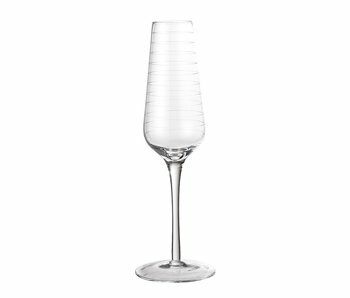 Fun Bloomingville champagne glass made of glass. Good to combine with the glasses from the same series! The size of the glass is Ø4xH25 cm with a capacity of 240ml. The glass is dishwasher safe. Nice Bloomingville wine glass made of glass. Good to combine with the glasses from the same series! The size of the glass is Ø9.5xH23 cm with a capacity of 500ml. The glass is dishwasher safe. Nice Bloomingville wine glass made of glass. Good to combine with the glasses from the same series! The size of the glass is Ø10xH25 cm with a capacity of 650ml. The glass is dishwasher safe.